A series of posts on the possessions I own, and what has brought them into my life. This is the third post in my Objects Series about how much I appreciate the possessions I have, and the choices I made when bringing them into my life. Back in 2006 I was going through a time of searching for answers for life’s big questions. One of the things I wanted to do was to document my findings. Being the typical computer geek, I decided that the best thing to do would be to document everything on my computer. I started using OneNote to create a set of working documents which contained all these ideas and resources. I found that keeping everything together was extremely useful, but using my Tablet PC to write ink notes was way to clumsy – imagine trying to use a loud, hot, folded up laptop when you’re in bed reading a book and making notes. I just wasn’t practical. I went to WHSmith and picked up a cheap spiral bound notebook, and used a Uni-ball Eye pen (a favourite from my school days) to write down some of my thoughts. This was quite new to me, as I hadn’t really bothered writing large amounts of stuff down since I was at school about 7 years previous. These early notebooks consisted of lists of things I wanted to do as well as thoughts and diagrams trying to understand various subjects I had found interesting. Plus a good measure of doodling. 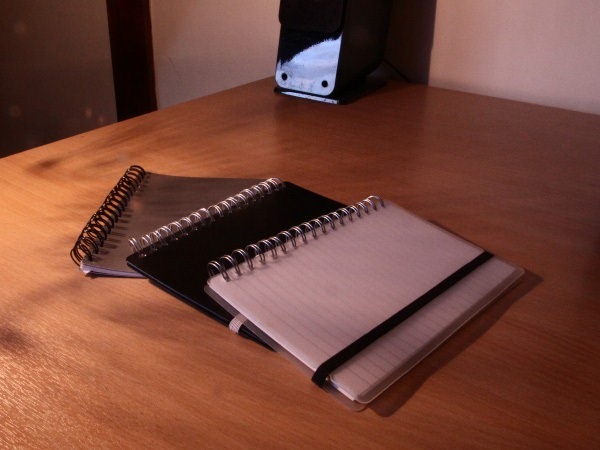 I found the exercise good, but the notebooks themselves were not very nice, and the ink was quite harsh for the paper. Some of the pages were removed when the notes were no longer important, meaning that the whole thing started to get thin very fast. I went through three of these notebooks fairly quickly. 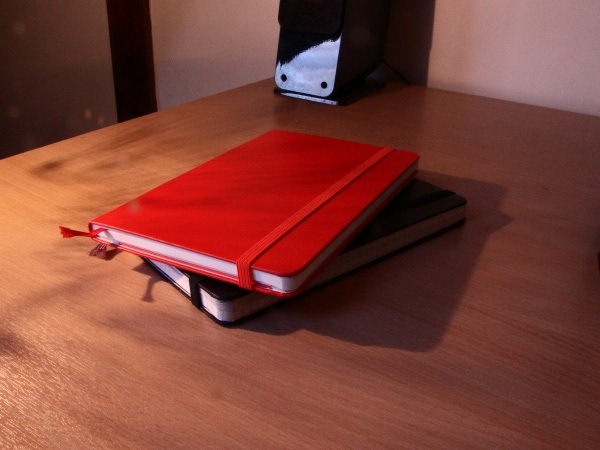 At the start of 2007 I got myself my first Moleskine notebook. I started using a Pentel pencil (a favourite for many years – though now discontinued) and I started using Post-it notes for more ‘disposable’ items. Also in 2007 I started a new job, and got myself a larger squared notebook for that task. Both of which I used a lot, and I feel it really helped me get my thoughts together in relation to a number of projects both at work and at home. 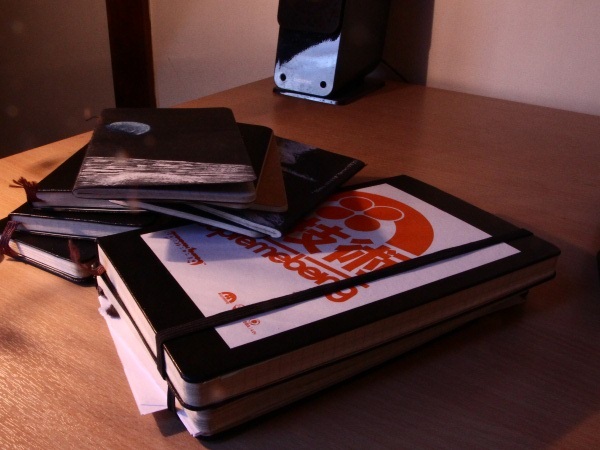 Over the next few of years I also went through quite a few of soft-back Moleskine notebooks, each for a different project that I felt needed exploring on its own, as well as a one or two hard-backs per year. As is usual with anything I do, I start to refine and simplify things after a while. 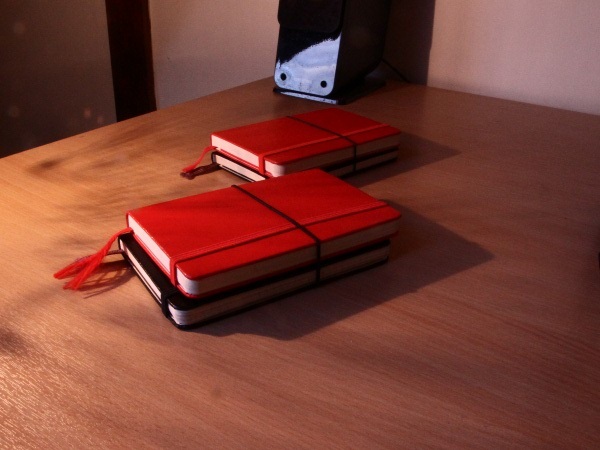 In 2010 I decided to try something different, and reduced the number of notebooks I used down to the minimum. Most of the time I’d make notes using a Kuru-toga pencil, but thanks to my discovery of the amazing Jetstream series of pens, I actually started writing in my notebooks with ink again. Usually, I go for one of my favourite pens depending on what I’m doing, though I have been known to try a number of different pens! 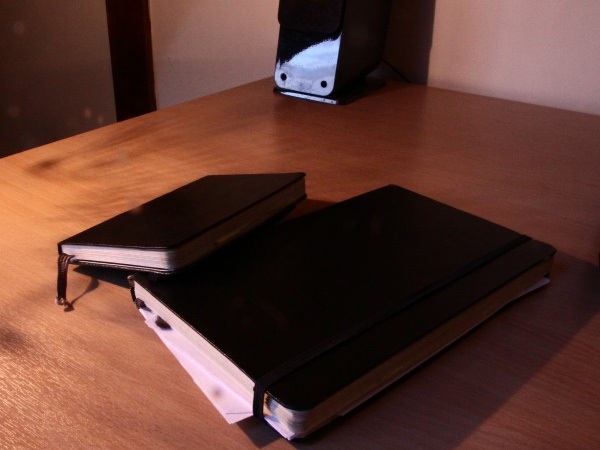 This combination worked really well, and I did exactly the same thing in 2011, but in 2012 I’ve decided to try and reduce things even further, so this year I’m only going to be using two notebooks day-to-day. As is usually the case with things like this, when you look back retrospectively you wonder how you managed to do without something like externalising thoughts, and while I do believe having a fancy notebook and pen adds to the experience – I think just writing things down is the most important lesson I have learned from my use of notebooks over the last six years. This is the second post in my Objects Series about how much I appreciate the possesions I have, and the choices I made when bringing them into my life. I have enjoyed photography for as long as I can remember, but the first camera that I owned which really let me take impressive photographs was my Canon G9. I absolutely loved that camera – it had manual controls in a compact body, and with the zoom adapter I was even able to capture a photograph of Jupiter’s moons. Although the photograph itself was very poor, it really got me interested in being able to photograph the night sky. To do this properly, I’d have to get myself a some more stuff. When I started looking around at the equipment I’d need to take decent photographs of the planets I realised that I’d need to get myself a proper telescope. But then the problem is which should I get first, the digital camera or the telescope? And should I get a CCD or an SLR camera? Because I also wanted to take photographs of other things, I decided the best thing to do would be to get myself a decent SLR camera with a good general purpose lens, and invest in a telescope at a later date. I went around the shops and tried out various cameras to see what I thought of them, the two I was looking at was the Canon EOS 550D and the Canon EOS 7D. Both very impressive cameras which would suite my purpose. But upon actually holding the 7D, I quickly realised it felt a lot more substantial than the 550D and felt really good in my hand. I knew which one it had to be. 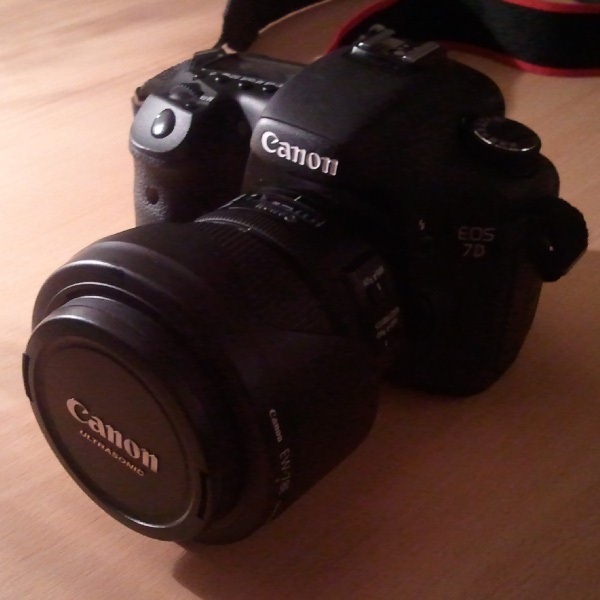 I’m very happy with my Canon EOS 7D, it has served me very well so far. I don’t know if the 55D would have survived the freezing temperatures of Kielder – where my camera was literally frozen over night. Plus I’ve already taken way more photographs with my 7D than I have with any other camera I have owned, and I’m not just talking about the timelapse videos! If you are interested in purchasing the Canon EOS 7D, or any other camera for that matter, check out Camera Labs. Their in depth reviews and videos really helped me decide which camera I wanted. Having too many possessions is a problem that a lot of people seem to have these days. While I now I try to avoid collecting unnecessary baggage, I also like to appreciate the things that I do have in my life – big and small. Over this month I’m going to write a few blog posts about these objects that I appreciate. Objects Series. Though I had to import it from Japan, the Casio GIEZ GS1300B-1 fit all those requirements, and came in an attractive black body. Unlike the majority of G-Shock watches, the labels for the buttons are actually written on the back cover. To me, this is a lovely touch – the information is hidden by default, but easy to learn. 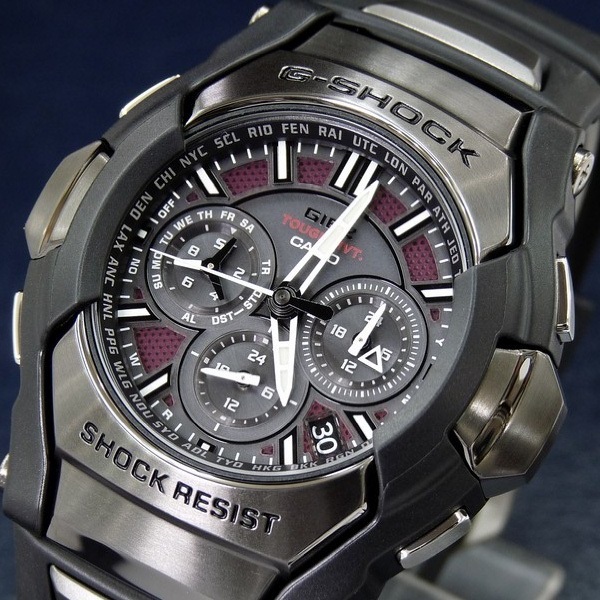 This actually makes this model feel significantly more subtle when compared to other models in its G-Shock family. The front face of the watch may still be seen as complex to some, but it shows only the information required for the function it is performing, and nothing more. The numbers and lettering is bold, clear, and the main hands glow in the dark for hours after being in light. Under the face there are some invisible features that you’ll never notice. The tough movement ensures that the hands are always pointing in the correct direction – even after a knock, the time is calibrated every day from radio signals, it’s 200 meter water resistant and it saves battery power by turning off the second hand when it is dark. To me this device shows how a timepiece can be a functional tool, as well as being well designed and attractive. There is a theme behind the design of this watch, to enable to user to know what time it is based on the criteria they are interested in. Previous watches of mine have tried to do too little or too much, and out of all technological trinkets I own today – this is my favourite piece.